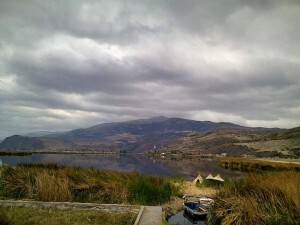 A large, if assuming, set of buildings lie alongside the quiet road, surrounded by a simple fence, sitting opposite the reed laden shore of Lake Huacarpay. It was here that the very first volunteer work of this South American trip took place. Urpicancha itself is only the beginning of something, but it has an incredible amount of potential. It has a kitchen capable of cooking for large numbers, a large dining room, and rooms for rent to those who want them. As it stands, the only permanent occupant is a man named Enrique. 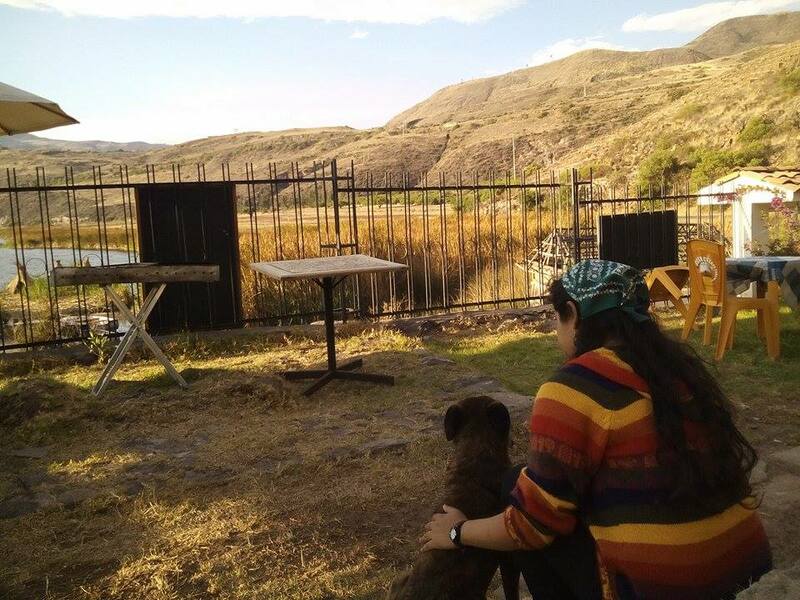 Together with his tranquil dog, Sisi, they accept volunteers to help in the slow process of maintaining this place and preparing it for its potentially bright future. We spent just over one week here, but it is a place I will not soon forget. 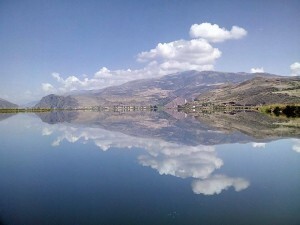 Urpicancha and particularly its surrounding areas are beautiful. It is profoundly quiet, with the only sounds being the occasional passing car, or more commonly the simple buzz of insects; the constant background noise of a living place. 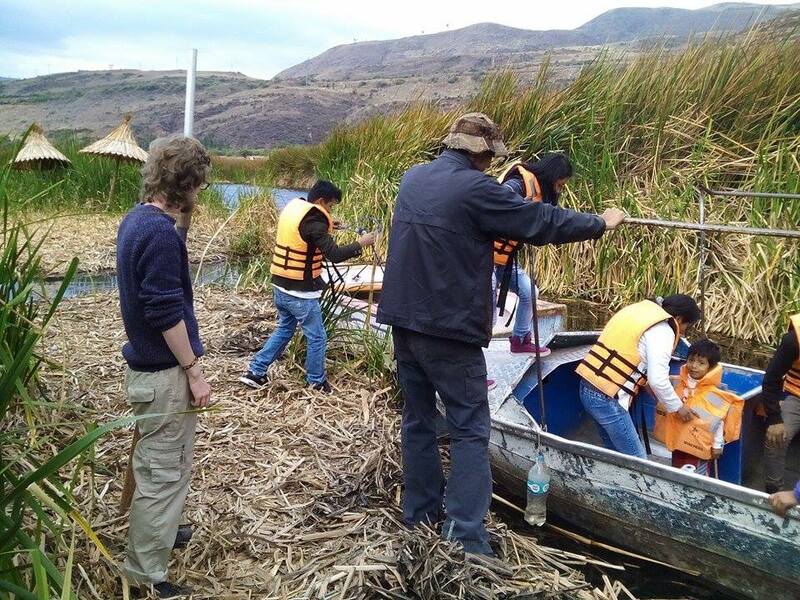 The lake is an obvious point of focus, bordered by tall yellow reeds, with Huacarpay visible only as a handful of tiny colored boxes on the far shore. On the horizon, large mountains loom, covered in broad green swathes of forest. 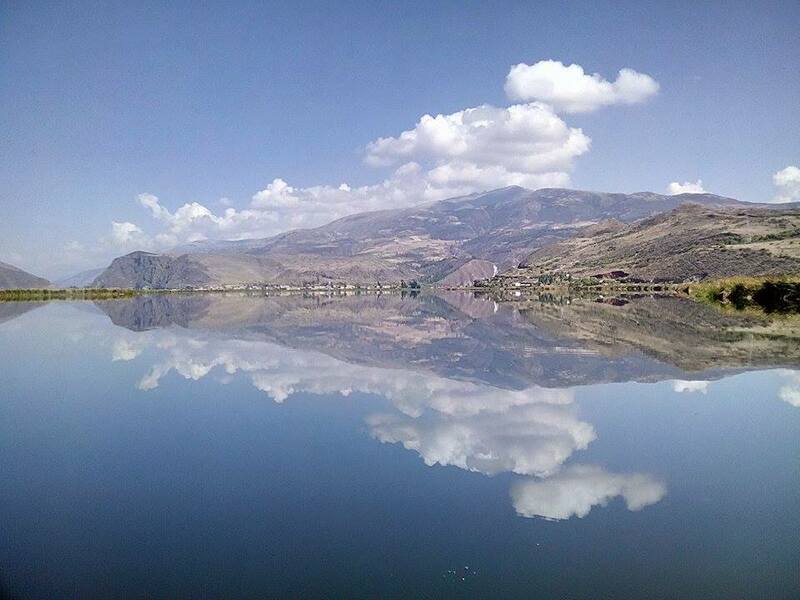 In the mornings, the lake is so still that it becomes a vast mirror reflecting the sky. As the day moves on, the wind usually picks up, slowly building until peaking just before sunset, when the lake becomes turbulent once more. 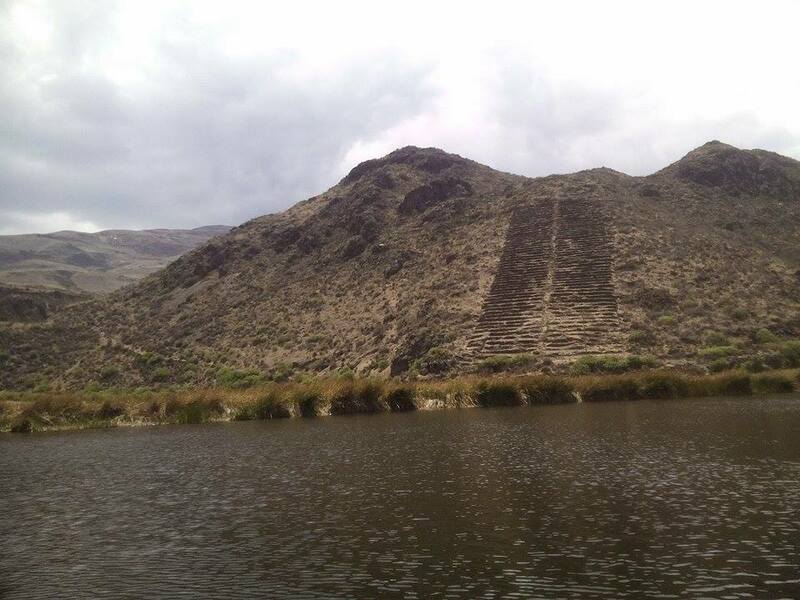 Behind the small cluster of buildings, facing away from the lakefront, massive hills rise, where lay unnamed and little known Incan ruins. The telltale stone steps, yards long and as high as a grown man, once used for growing crops in another age, peek through the landscape and underbrush. 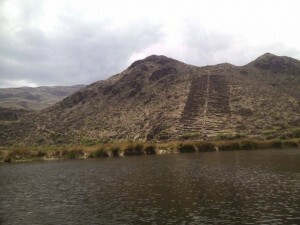 On a given afternoon, when the sun’s seat heat begins to wane, you can take a two hour hike to the summit of these hills, and enjoy a truly spectacular view of Lake Huacarpay. We arrived here after a short ride in a taxi from Huacarpay, and were greeted by our preceding volunteer, a Mexican man named Armando. We sat out of the sun and spoke for a time, telling each other of our travels and plans, and he gave us a basic idea of the kind of work we would be doing here. It was fairly simple, and usually very quiet. 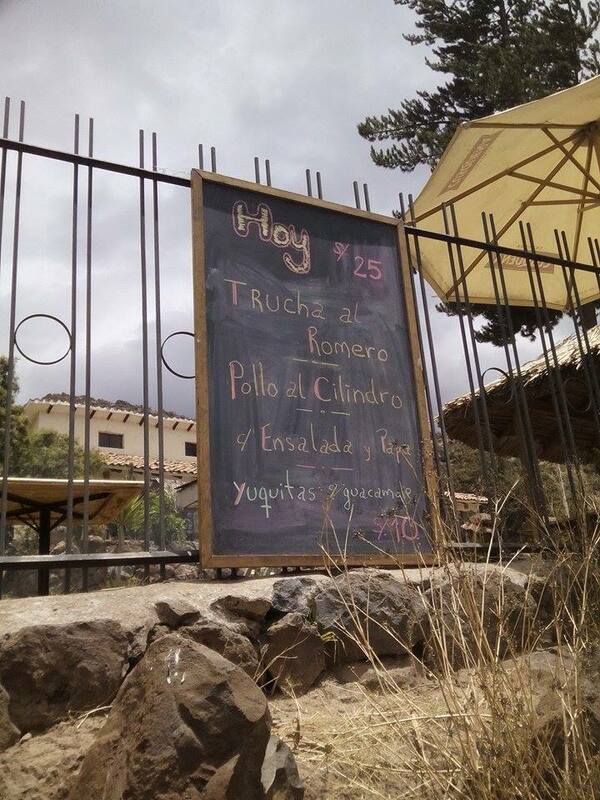 Although the place is equipped to act as a restaurant, Enrique only actually serves food on Sundays. He told me once that he doesn’t make any kind of profit on this act, and his sole motivation for doing it is to spread the word, again with the idea of fulfilling potential at some future date. Armando told us what we would be mostly doing was watering the grass (as there was very little rain here), and taking care of the boat hire. 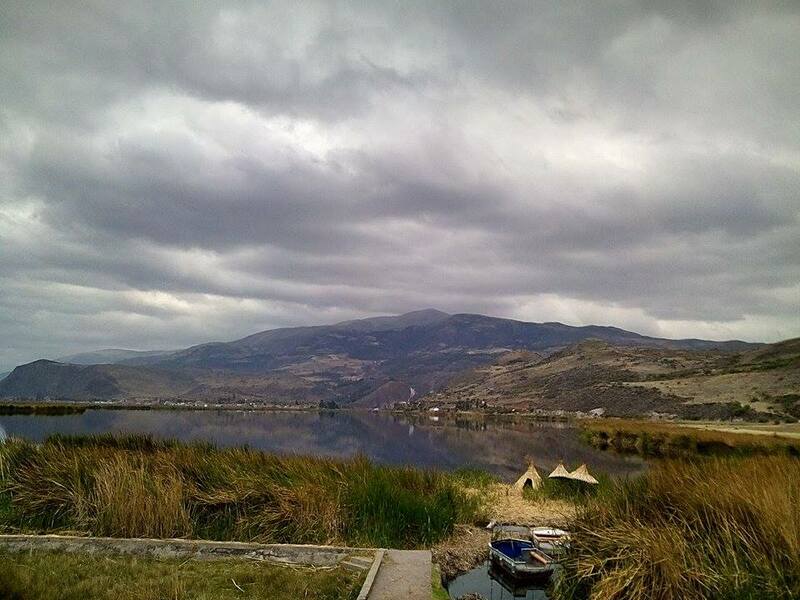 Directly across from us, on the lake shore, sat two boats which Enrique rented to passers by. 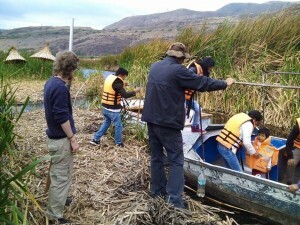 Our tasks mainly included handling cash, and helping push the boats out from their makeshift floating packed-reed dock. 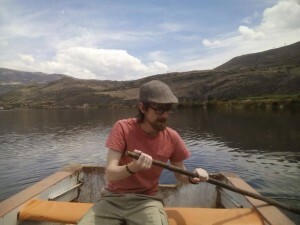 We took one of these boats onto the lake one morning when it was particularly quiet. It was a calming experience, if not somewhat difficult. The boats themselves had once been motored, and gaps where steering wheels and engine blocks once sat could clearly be seen. Now though, they had simple oars and nothing more. After an hour or so, Enrique arrived, and Armando departed, heading for Machu Picchu. Enrique was the kind of man you could call distinct. He told me that he had served in the navy for several years of his life, and I believe that this particular uniqueness about his personality was a direct result of military service. Standing at six foot, though with a slight slouch, and usually wearing the same baggy trousers, waistcoat, and flatcap, there was a particular intensity to his personality. He had a particularly European face, and claimed to have descended from an Irish bloodline. We spent the rest of the first day exploring and listening the Enrique’s stories, sleep came easy for me that night, with the aid of silence. The rest of our time at Urpicancha was peaceful. There are no real regular customers, just people travelling on the road who take notice of the sign advertising boat rental. 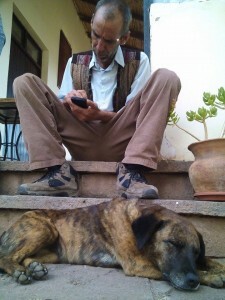 A few times during our week there, Enrique would travel to Cusco to help at a friend’s hostel, returning the following day. These days we ran the place ourselves, and I sometimes liked to imagine that this was my own business, that I had found a perfectly tranquil life. Much of my own time was spent simply sitting, and watching the lake. The days were hot and spent leisurely watering yellowing grass, in the hopes that they might someday sprout verdant, and the nights were spent enjoying the silence only afforded by a particularly kind of solitude, and enjoying the stars, bright pinpricks of light, too numerous to count. 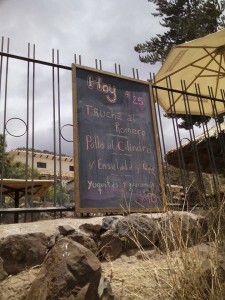 A few days before we would depart for Cusco ourselves, we had a change of pace. Sunday, as I’ve said is the day that Enrique served food, passed. Enrique arrived back from another trip to Cusco, this time carrying a bag of trout and chicken legs. The trout we stuffed with rosemary and butter, and the chicken we marinaded. Both were cooked in a large steel cylinder, with a fire lit at the base. 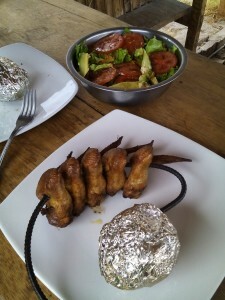 The trout would be roasted inside aluminium paper, and the chicken hung from hooks inside the cylinder to be smoked. We only got two sets of customers that day (due to poor weather in Cusco), so even then it was still quiet, but it was a welcome change of the pace, and the food we had prepared in expectation of larger numbers fed us for the next few days, and served with deep fried yuca, the food was fantastic. A few days beyond one week, and without any great ceremony other than a promise to meet up at some point in the future for one last game of chess, we left Urpicancha and the company of Enrique. The week had passed without any great adventure, no great stories to tell or tales to spin. Nevertheless, it is a place I will not soon forget, it may have only been a little over a week, but it felt as if time had passed differently. There was no real schedule, no urgency, time moved slower. It was a place where you could sit and simply be, surrounded by mountains and ruins, breathing the freshest air I have ever tasted, relishing the kiss of a cool breeze. Maybe some day I will return, maybe then I will find a bustling restaurant, full guest rooms, queues and queues for a boat. But until that day, I will enjoy the memory of a man and his dog, content in their solitude, and those bright stars, always shining.